If iodine seed implantation or to say “particle implantation” is compared to a precisely planning and prepared fixed-point “blasting”, it plays the same significant effect as "mines" in the treatment process--destroying massive tumor tissues in a certain time. By the opportunity of the Bangladeshi delegation’s visiting, Modern Cancer Hospital Guangzhou was arranging a live video particle implantation operation for observation. Now, let us have a playback on this perfect tumor fixed-point blasting process, and witness the magic power of 125I seed implantation operation. Participants of the “blasting engineering”: Particle implantation expert Bai Haishan as well as his operation team, oncology specialist director Peng Xiaochi and the interpretation team from Modern Cancer Hospital Guangzhou, the Bangladeshi press delegation. Why we applying the“blasting engineering”? Cancer to human body, is a process that cancer cells establishing its own “castle” in human’s body, and gradually transfer or spread and do harm to to other parts of the body. Without effective treatment, this “castle” will become more and more strong, and eventually resulting in a majority of the damage and loss of the body's normal cells. Modern Cancer Hospital Guangzhou first elects minimally invasive technology --125I seed implantation as the “blasting” tool, which can accurately place the iodine particles in the tumor, then “blasts” and destroys the formed cancer “castle”. Why to choose 125I seed implantation as the “blasting” tool? 125I particles are radionuclide which can release continuous and short distance gamma rays. They will lead to the breakage of DNA strands after a continuous irradiation, and thus kills the cancer cells. 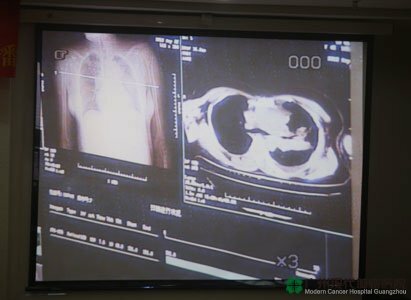 Position fixing: Experts of Modern Cancer Hospital Guangzhou firstly input the tumor size which is displayed in the CT and MRI to a three-dimensional stereotactic planning system ( TPS ), so the tumor size is restored to the original size in the stereo image. Number setting: Experts will design an overall treatment plan preoperatively on the basis of the location, shape and size of the the patient’s tumor. They will calculate how many single iodine particle should be implanted and the exactly implantation position of each iodine particle accordingly. Placing the explosive 125I particles, which is considered the most tense moment during the whole “blasting” process. 125I particle is actually composed by iodine which is absorbed in a silver bar and a welded titanium shell. The diameter of which measures 0.8mm, length 4.5mm, titanium cup wall thickness 0.05mm and the center diameter 0.5mm× 3.0mm. 125I particles just act as bullets with strong lethality in the treatment process of cancer. Experts placed 125I particles directly into the tumor tissues with special equipments in the guidance of laparoscopic, or CT and B ultrasound images according to the treatment plan, and precisely target to the cancer cells. Tumor tissues which are in the sensitive period will appear a large area of necrosis after radiation exposure. The whole process of 125I particles to kill cancer cells is a continual one. Generally, cancer cell necrosis can be seen more obviously after 2 to 3 months of the particle implantation. If the tumor is in the body surface, we can see it is shrunken gradually by naked eyes; If it is in the deep of the body, we need observe the shrunken or necrosis cancer cells with the help of CT or B ultrasound examination. Because of the precise location, other normal tissues of the patient are almost never damaged. In order to make the Bangladeshi journalist delegation understand the clinical use of this most advanced minimally invasive techniques more clearly, Modern Cancer Hospital Guangzhou invited oncology expert director Peng Xiaochi to make a simultaneous site explanation. Accompanied by director Peng Xiaochi’s detailed explanation on the synchronously output operation image, the journalist delegation can know the operation process of every detail clearly, including the CT imaging of the patient’s tumor location, the placing position of each particle, and the operation process of the particle implantation equipment system. The expert team’s skillful operating techniques, well-arranged operation process, and tacit operation teamwork have left the press delegation a deep impression. After the live video of the operation, the press delegation said with feeling that:" in Bangladesh, we can’t imagine that a cancer operation can be so precise! Compared to the traditional resection operation we do, particle implantation acts just like some kind of power which is quietly injected into the body without large wounds. This has been the best treatment and care for the patient without making them painful and bleeding, but continue to survive."